I am a former Republican. I was born and raised in a Republican household in Atlanta, Ga. While I was growing up “Firing Line,” staring William F. Buckley, would play on our TV every Sunday via the local PBS station. When I was old enough to vote in 1972 I voted for Richard Nixon. I voted for Gerald Ford in 1976, and Ronald Reagan in 1980. It was during Reagan’s first term that I realized what a horrible mistake I’d made voting for Reagan in particular and the Republican party in general. George Carlin produced an incitefully funny and incredibly true monologue from that period (1988) called “The Truth About Republicans.” That’s were I wound up in my view of Republicans and the GOP due to the Reagan administration, and nothing has changed my attitude since. Which means that if I can’t stand Trump and can barely stand Hillary, then the only logical choice for me is to hold my nose while voting Hillary to keep Trump out of the White House. 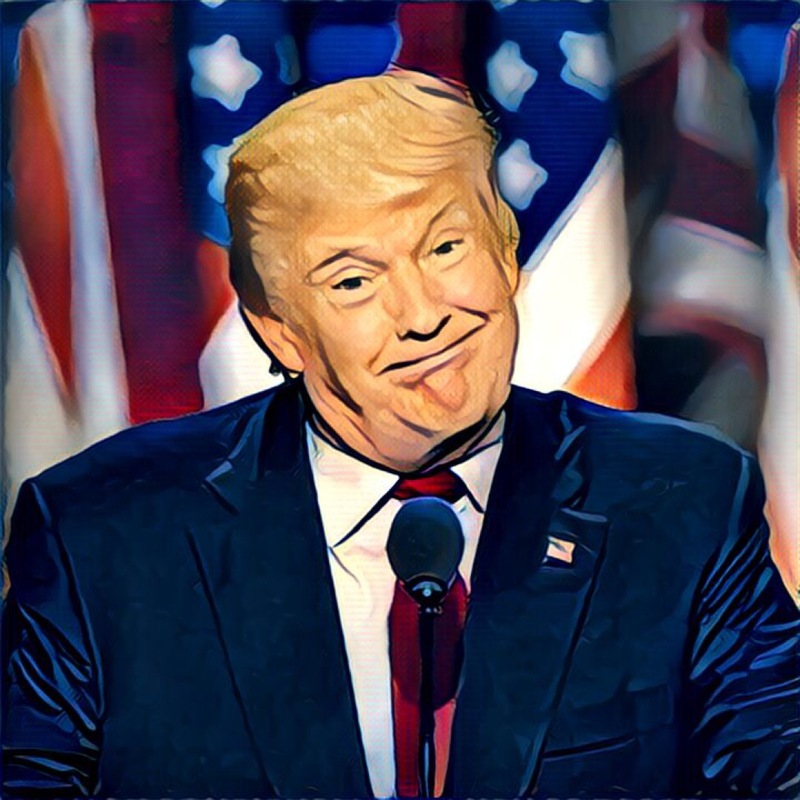 After watching the Republican National Convention and four days of unabridged hucksterism (along with racism and general social depravity) I’m still stunned that the person absolutely least capable to lead a nation of nearly 400 million was selected as the Republican presidential candidate for the 2016 election. In hindsight Trump is the product of nearly five decades of deliberate intellectual evisceration of the Republican party by a very select few of very rich conservative donors who are still seeking revenge for what happened to Nixon. They molded the party, and in the process attracted a base, that has absolutely no critical thinking skills, and who are easily swayed by racism, isolationism, and anything that caters to their entitlement mentality; the Republican base feels they’re entitled due to their age and whiteness and false sense of superiority. They wanted a party that was totally controllable, that wouldn’t ask the important embarrassing questions, and after decades of hard work that’s exactly what they got. Then Trump came along, recognized what had been created, and took it all away from them like candy from a bunch of babies. Trump may be a failure at business, but he has an innate genius for sussing out what it is that will con the week minded such as what passes for a Republican these days. It’s that power that he’s used to win the nomination. It didn’t matter if the “regular” Republicans didn’t show up to the RNC, nor Trump win all their endorsements; the Republican base stopped listening and caring about Rubio, the Bushes, and Cruz years ago. What happened at the RNC this past week just formalized the split that will finally kill the Republican party as it has come to be known by. All we have to do as democracy is find some way to survive the results, and if at all possible, find a way to repair the civic damage that’s been done over the past five decades. It’s no secret I’ve been spending a considerable amount of time working only with my MacBook Pro. The tools I want and need are available on that platform, and I like the way Mac OS X works and looks. When I’m not working on the MBP I’m working with Linux, either with the old Samsung notebook and Ubuntu, or via virtual machine guests hosted on VirtualBox under OS X. The only time I even power on my Windows 10 notebook is to pick up the security updates that Microsoft continues to release. I am grateful for those updates. And then one day I finally decided to become part of Microsoft’s Windows Insider Program. I put this notebook on what Microsoft refers to as the “slow ring” for early releases. I get early releases that are as stable as possible, and on a slow release cadence; hence the name. 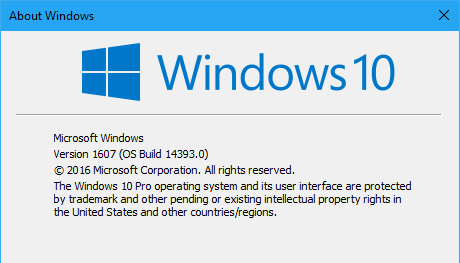 Tonight build 14393 was downloaded and installed on this system. This should be the final early release before the official Anniversary release. Nothing horrible has happened. If anything, the overall Windows 10 system is fast and stable. The look and feel of the desktop has been changed in subtle ways so that it’s now noticeably different from what this Samsung notebook was originally sold with, Window 8 Pro. I played a bit with some of the applications, one of which is Edge, the browser replacement for Internet Explorer. I must admit I like the way it operates. I reminds me a lot of Vivaldi. I installed the Adblock Plus browser extension to turn off the incredibly intrusive and annoying ads from Wired and Ars Technica. 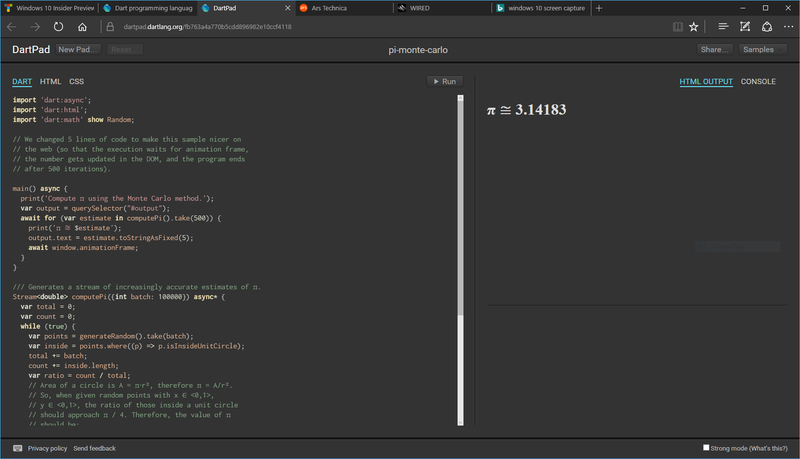 I also decided to see how compliant it was, so I visited the Google Dart web page and brought up DartPad, the browser-based editor and execution test tool. From what I can tell there is absolutely no difference between how DartPad works with Edge or any other browser under Windows 10 (Vivaldi, Chrome, and Firefox). It just works. Oh, and I’ve enable the dark theme, just like I’ve enabled every other application’s dark theme if it has one. Not only did I run this sample Dart example, but I wrote this entry with Edge. I’m thinking maybe that Edge is a pretty good browser. Windows 10 is certainly being refined into something different than Windows 8. Please note I liked Windows 8 quite a bit and had no issues using it. I was not happy when Windows began to “regress” back towards Windows 7 and earlier. I was very unhappy with Windows 8.1. But Windows 10 might not be so bad. Still, I’m distrustful of Microsoft; because of that mistrust I’m still on the long path away from Windows, only using it when I have to, or when I want to try something out, like this little test. For the most part it sits powered off in its bag until I pull it out to check for security patches and updates. But for people who are still committed to the Windows platform I believe that Windows 10 Anniversary edition, which is to be released in August, will be a very good release.